“All We Have Left” by Boyce Avenue will be available on iTunes and Amazon.com June 15. It’s no secret that the Internet has changed how the music industry operates. Bands can now do most of the duties formerly reserved for major record labels — promoting, booking, recording and distributing — right from their laptop. But very few bands in this modern age have managed to completely flip the script quite like Boyce Avenue. Sarasota brothers Alejandro (lead vocals, guitar, piano), Fabian (guitar, vocals) and Daniel Manzano (bass, percussion, vocals) took turns going through the Southside to Pineview to University of Florida line of schooling. After all graduated and eventually reconnected back home, they decided to start a band, naming it after the location of their childhood home on Boyce Street. But instead of following the usual routine of getting music out to the masses, peddling poorly produced demo CDs at sparsely attended local live performances, they just went straight for a worldwide audience. Thanks to some unique cover song variations and a few viral videos, they soon captured it. Over the next two years, videos for songs like Carrie Underwood’s “So Small,” Justin Timberlake’s “LoveStoned,” and Coldplay’s “Viva la Vida” garnered a colossal amount of hits. The band’s YouTube channel has now become one of the most frequented in the world, with over 175 million views and nearly 300,000 subscribers. As their global audience exploded, Boyce Avenue hit the studio to self-produce their debut full-length album. They started directing their legion of online fans to their MySpace page to sample their brand of pop-rock original tunes. “We were like the number one or number two unsigned artist in Florida on MySpace back when MySpace meant something,” says Alejandro. Boyce Avenue’s proving ground was New York City. Instead of inviting record company reps to their home turf, as customary, the band decided to impress prospecting labels in January 2009 by unveiling the online marketing juggernaut they had created with a showcase concert at NYC’s Mercury Lounge. They had never performed in the state of New York, the show was at 7 p.m. on a Monday, the weather was near blizzard conditions, pre-sale tickets were not available and they had less than a month to promote it. The show sold out with hundreds being turned away at the door. The band returned home on a mission, quickly booking a string of shows and hitting the road for their first tour of the states. They sold out or neared capacity at every venue they stepped in. By fall of 2009 they embarked on their first European tour, packing clubs in France, Germany and the United Kingdom. Just before returning to the Philippines in early 2010 to dazzle another 18,000 spectators over two performances and another successful European tour following that, the band had wrapped up the recording of their debut full-length, a 13-track mix of mainstream rock and emotional balladry titled All We Have Left. The achievement was substantial for the brothers, as each member filled a dual role over the course of their self-produced music project: Alejandro taking the lead in music composition, Fabian covering graphic design and website management, and Daniel acting as the band’s liaison for business relations. All We Have Left will be released jointly through Universal Republic and 3 Peace Records on iTunes and Amazon.com June 15 with the physical CD release coming in a few months. 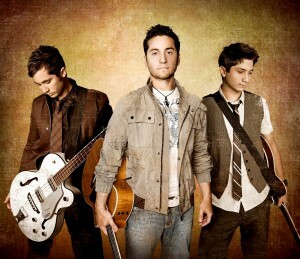 Boyce Avenue will embark on their second U.S. tour this summer with a date at Orlando’s Backbooth on July 2.